The south Florida shelf is generally less than 12 m deep (Enos, 1977), with the direction of surface and subsurface water flow being generally to the south (Douglas, 1947; Porter and Porter, 2002). The bedrock is porous limestone. This geologic interconnectivity links effects of human activities on inland and nearshore areas with shallow-marine biologic communities on the shelf, including the offshore coral reefs. The most recent part of the south Florida bedrock consists of five marine units known as the Q1-Q5 Units (Perkins, 1977). The Q Units represent the most recent period of geologic time, called the Quaternary Period. The Quaternary consists of two epochs, the Pleistocene (from about 1.8 million to 10,000 years ago, or ~1.8 Ma to 10 ka, Fig. 7B) and the Holocene (the most recent 10,000 years of time, or 10 ka). Each Q Unit is separated by an exposure surface or unconformity (Perkins, 1977), a soilstone crust that corresponds to thousands of years during which sea level was low and the exposed shelf was dry land. The marine units and unconformities represent five of the numerous sea-level fluctuations known to have occurred during the time bedrock in Florida was accumulating. The Florida Keys developed during one of those times the shelf was flooded. Sea level at that time (~125 ka) may have been as much as ~10.7 m higher than at present (Hoffmeister, 1974; Halley and Evans, 1983). The islands consist of a central, linear, arc-shaped coral reef with tidal bars of cemented ooids at either end. Ooids are tiny concentric spherules of calcium carbonate that precipitate in warm, high-energy, generally very shallow marine waters. When cemented, ooids form oolite, a limestone (Fig. 7A). The reef, known as the Key Largo Limestone (Sanford, 1909), forms the middle and upper Florida Keys. The tidal bars, known as the Miami Limestone (Hoffmeister et al., 1967), underlie the city of Miami to the northeast and form the lower Florida Keys to the southwest. Both formations are well dated. The tidal bars in both the northeast and southwest areas are oriented more or less perpendicular to the Key Largo reef. The bars in the lower Keys originated as an east/west mound of unstable ooids and were shaped into northwest/southeast sand bars by strong tidal currents flowing in those directions. During the higher stand of sea level, the reef focused currents around its ends, causing precipitation of ooids from the water. 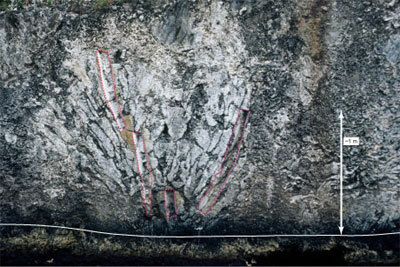 Throughout the keys, both formations are coated with soilstone crust. The Key Largo Limestone reef extends from beneath Miami Beach, where its elevation is below sea level, to Soldier Key (upper Keys), where it makes its first appearance as an island, to the Newfound Harbor Keys (lower Keys), where it last appears as islands, to the Dry Tortugas (Gulf of Mexico), where it is again submerged (Fig. 6A; Shinn et al., 1977a). The limestone varies in composition but is typically characterized by the massive framework-building head corals Montastrea annularis, M. cavernosa, Porites astreoides, and species of Colpophyllia and Diploria (Hoffmeister et al., 1967; Hoffmeister and Multer, 1968; Perkins, 1977). Montastrea annularis is by far the dominant coral. Skeletons of these corals can be seen today in the walls of man-made canals (Fig. 8). These types of corals require calm-water conditions, so their presence indicates that sea level was sufficiently high to preclude wave action in their vicinity or that they were protected from wave energy in some other manner. 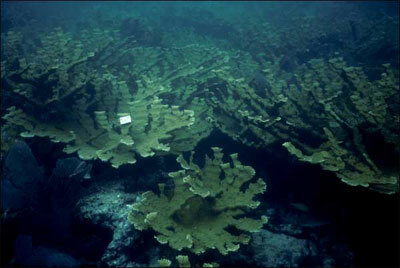 Branching acroporid corals, on the other hand, require well-circulated water and grow where wave energy is high (Shinn, 1980a). They act as baffles, dispersing wave energy. The platy framework-building Acropora palmata grows no deeper than 5 m below sea level (Fig. 9; Shinn et al., 1977a). Except for a few small fragments, A. palmata is not found anywhere in the bedrock of the Florida shelf. Its absence may indicate that water depth was greater than 5 m or that there was no surf zone where Pleistocene reefs were growing on the shelf. Acroporid corals are particularly sensitive to adverse environments. For that reason, their absence from the shelf bedrock has also been attributed to periodic influxes of hot or cold platform-interior waters during the higher stand of sea level. [The Florida platform at 125 ka was approximately the size of the modern Great Bahama Bank (GBB) and, like the GBB, would have periodically infused deeper shelf-edge waters with shallow platform-interior waters (Harrison and Coniglio, 1985)]. However, A. palmata does occur in Pleistocene reefs seaward of the shelf margin, albeit in sparse frequency (Toscano and Lundberg, 1999). These offshelf reefs are called outlier reefs because they are separated from the shelf by backreef troughs (Lidz et al., 1991). In contrast to its general absence in the Pleistocene bedrock, A. palmata flourished on outer-shelf reefs of the present reef ecosystem as recently as approximately 7 to 2 ka (Figs. 3E, 9; e.g., Shinn et al., 1977a).